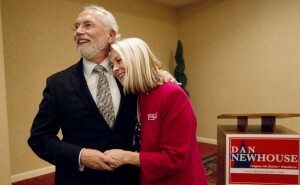 Washington's newest U.S. House member is Dan Newhouse, a former state agriculture director, Republican legislator, Sunnyside farmer and Main Street conservative. Newhouse has moved out to an insurmountable lead of just over 3,000 votes over fellow Republican Clint Didier. Only about 10,000 votes remain to be counted in the tight 4th District race. The lead will shrink a bit when Franklin County, where Didier lives, updates its vote count Friday evening. Overall, however, Newhouse has bolstered his advantage. The 4th District runs from the U.S.-Canada border to the Columbia River. It includes seven Central Washington counties plus part of Walla Walla County. While a land of mighty federal dams, U.S. Bureau of Reclamation irrigation projects, the Hanford Nuclear Reservation, national forests and Indian reservations, the 4th District is deeply conservative and suspicious of the federal government that feeds it. Under Washington's "top two" primary system, the district became the scene of an all-Republican shootout between the GOP establishment and the Tea Party movement. Didier is a Tea Party activist, a former Washington Redskins tight end, Eltopia farmer, and foe of the kind of federal projects that supply him with irrigation water. He has called for the U.S. to get out of the United Nations and get the U.N. out of the United States. He ran ahead of Newhouse in the primary election. Establishment Republicans put together a PAC and aired a TV spot decrying Didier's "weird and extreme views." The TV spot showed Didier at an Olympia gun rights rally, declaring: "Get your ham radio. Get it in a box and get it buried in the ground." The Newhouse lead comes entirely from the candidate's home county. He is running 9,500 votes ahead of Didier in Yakima County, with a 1,000-vote lead in next-door Benton County. Didier has carried Okanogan, Douglas, Grant, Adams, Franklin and Walla Walla counties. The anti-government Didier piled up his biggest margin -- well over 60 percent -- in Grant County. Grant County's economy was created by the half-million-acre Columbia Basin Project and Grand Coulee Dam, the federal government's greatest creation in the state of Washington. U.S. Rep. Doc Hastings, R-Wash., has represented the 4th District for 20 years. He has been the most conservative and least collegial member of Washington's congressional delegation.